The tale of Riley the Rollerblade Bird is a true story with an unlikely happy ending. It is a cautionary tale of the dangers of “good intentions.” It is a sad little tale about the everyday tragedies and indifference of nature. And today, it provides the inspiration behind a poem to illustrate a photo. The theme of Photo 101 is “Solitude,” a state I crave like water when the busyness of the day is too much. Some see solitude with sadness, but I don’t mind flying solo, now and then. My nest is never really empty, either – my husband fills it with his presence every day, and my grown-up fledglings know how to stretch their wings and find their way home, as my daughter did, this past weekend. It’s a warm and cozy nest. Hushed leaves hide a solitary nest. Its silence loud, the louder crickets sing. Reminds me: Riley the Rollerblade Bird. To think I could chew up grubs, make you live. Wren hatchlings need what wasn’t mine to give. Relief let loose a sob; my heart soared, too. You slept – so full of trust, without concern. Met you, and shared a gentle, southern breeze. The lone nest, tucked into the highest branches of my Climbing Tree II would have been hard to spot before winter turned the branches of the tree to skeletal arms. 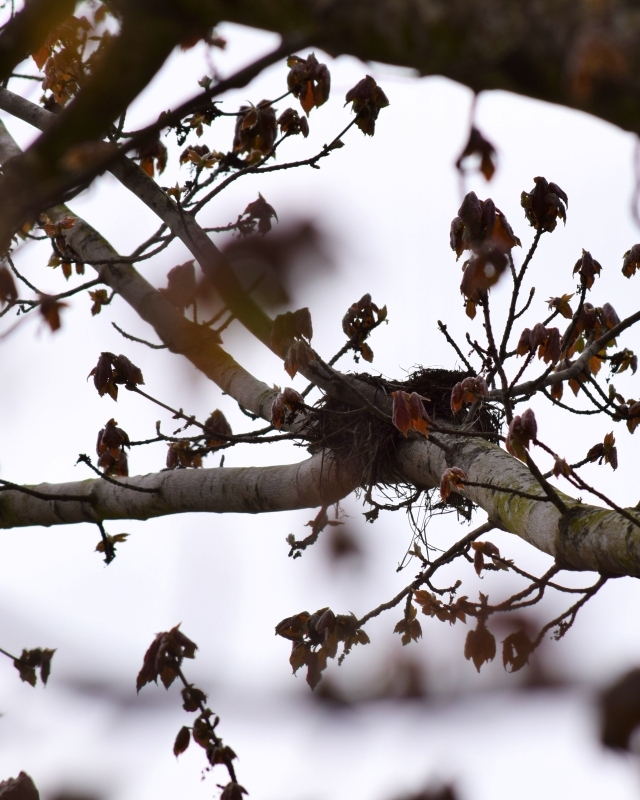 In a few weeks – or days, at this rate – the tree itself will be fully fledged and its new leaves will have unfurled to conceal the nest again. Great photograph. The new camera? Rummuser recently posted…Education III and Donkeys/Asses. Yes, indeed! The weather’s been a little dreary, but I wanted to try out the telephoto lens, and that nest was just up there begging me to focus on it.